Well, I know that Yesterday was Father’s Day but why restrict this occasion to only one day, I say! “Coz He is the reason I am – and for what I am today! Right from the beginning, he stood by me like a solid rock against all the odds – instances like when He stood against the world when I wanted to pursue my dreams till when I wanted to get married to the Guy of my Dreams and every little thing in between! Not one, not two but the world said “Civil Engineering is not for girls” but he begged to defer and made sure that not only I pursue it but also top the University in the same. A support I wouldn’t have survived without. He asked me to be discreet and never spell the magic words he once whispered into my ears – “Do Right & Be Strong, Face the World with all your Might, coz your Baba would always be there by your side” and I think that’s the very reason I fear No one today! My Baba is All My Pride – My Strength – My World too! Having said that My dad, like most of the dads, never gave importance to what one wears as he believes that one shouldn’t judge a book by its cover, which is good! But, there’s no harm in looking good, right? Even now, my Maa really has a hard time convincing my dad to belt his trousers slightly below his belly and force hard on him to try new colors. Yes, so if you haven’t sensed it yet, my Dad’s style quotient revolves around wearing formal shirts (the colors of which are restricted to only whites and browns and on days when he’s little more casual, the color only extends to the Blue Family) with trousers, the colors of which are again restricted to only blacks & browns and accessorizing it with a belt and a pair of black shoes. Be it a Monday or a Sunday, a normal day or even a special occassion, Plain bland trousers and shirts is his way to go and I certainly not like it. I mean, just imagine, so much of his affection for the basic pair that even on my wedding day, my dad’s style quotient was no different except that he wore a blazer on top of it (which he again removed after like an hour), so back to the basics, phewwwww!!! 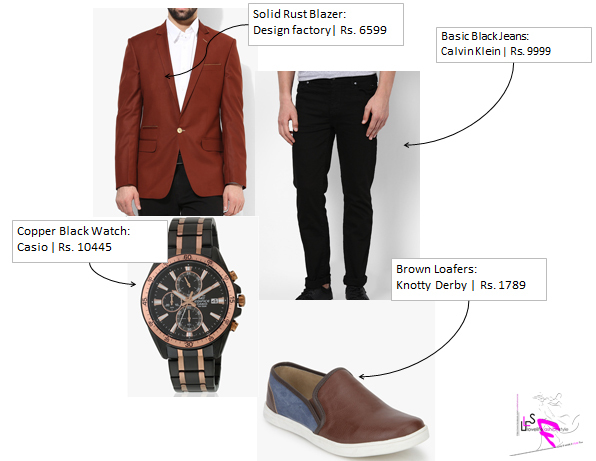 So, when Jabong.com contacted me to design looks for my dad, I couldn’t afford to miss this chance. 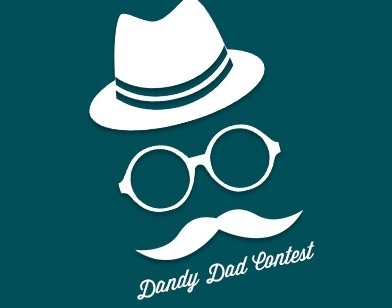 #dearydad to #dandydad was after all only a few steps away with Jabong.com. True to his style, comfortable and free, these pair of linen trousers will keep him comfortable while the texture of grey and classic solid blue will keep his style quotient high. 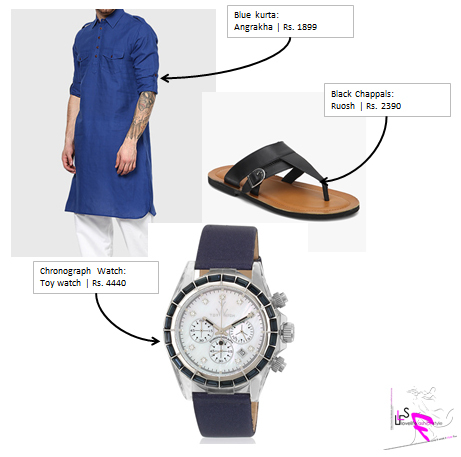 A pair of chic brown sandals and a leather watch to complete this look. As I always say, let’s not the plain old whites and blacks dominate your formals and let some colors intrude your work space and hence for my dad too, i would want the colors to do some talking. So, for this corporate look, I have injected some colors while keeping my dad’s comfort sentiments in mind. The light pink checked shirt adds some freshness while the dark grey trousers balances the look. 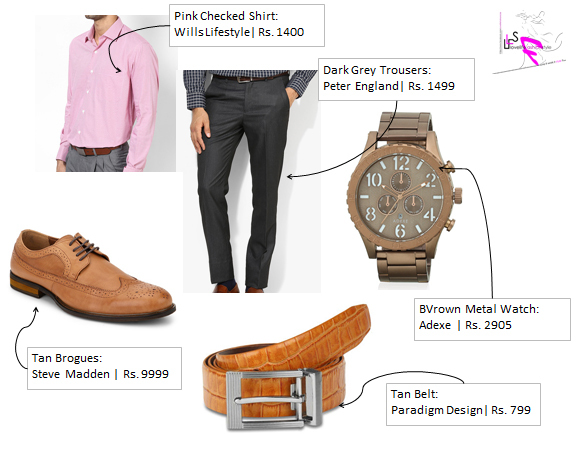 Tan belt and tan brogues to add a dash of smartness and to complete the look. A colorful and playful blazer is what I want my dad to try out on those special days to look that extra special 🙂 . This Solid Rust color blazer will compliment his beaming personality and dark grey hair. Pairing it up with basic black jeans a a white shirt and just a pair of bright loafers to complete the look. 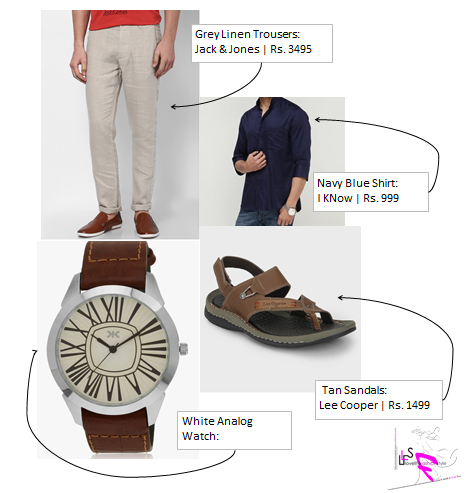 Hope you guys enjoyed this post as much as we loved creating it and do check out Jabong.com for some awesome gifting ideas for the men in your life, they have some cool merchandise across all age groups and across all taste.